I know...totally random title post. But it is the truth....I ADORE white cardstock. I always have! When I actually used to scrapbook....it was pretty much the only color of cardstock that I scrapped with. Now, I use all colors of cardstock for cardmaking....but white is definitely a go-to, as is kraft. My favorite white cardstock is the KI white from Bazzill, which has the orange peel texture to it. I think it is the purest white out there. But, I'll use all types of white cardstock, as long as it isn't dingy looking! I am an EOU of white cardstock....tee hee! So, I went all CAS (clean & simple) the past couple of days, and I have a few cards to share with you. First up is my card for this week's sketch at CPS. I flipped the sketch longways, and used hearts in place of the octagons. Here it is! Instructions: Stamp the heart six times with rainbow colors of pigment ink, and set aside to dry. Fold black cardstock in half to make your card base, and round the bottom corners. Round the bottom corners of a block of white cardstock and adhere to the front. 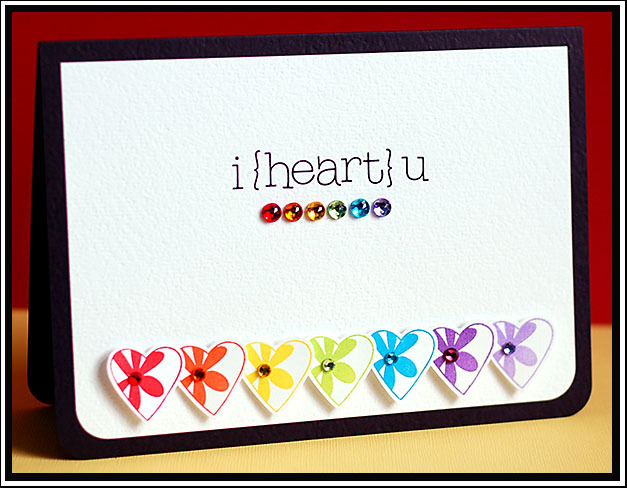 Add the rub-on sentiment to the middle, and underline with six rainbow colored jewels. Once the ink has dried on the stamped hearts, cut each one out. Layer in a line at the bottom of the card, and accent with a jewel. 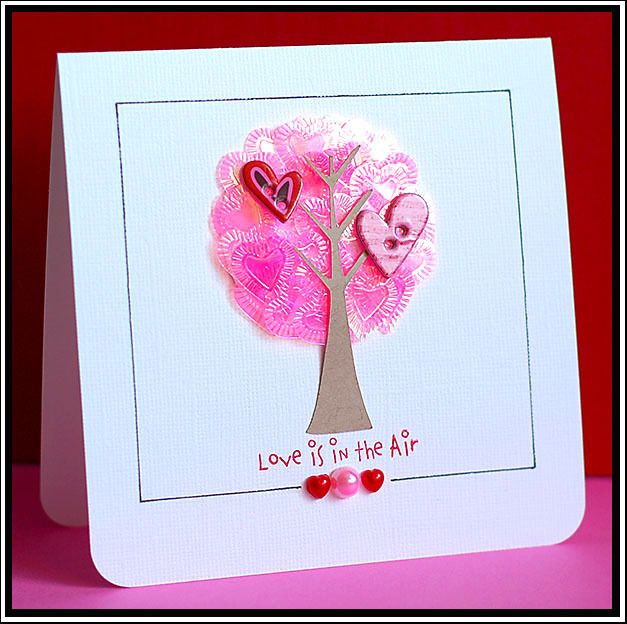 This next card is based on FTL76 at the Clean & Simple Stamping blog. The newest sketch was posted today, and I just LOVE it. Had to use it right away. This is what I came up with. Instructions: Fold white cardstock in half to make card base, and round the bottom corners. Tie ribbon around the front of the card. Draw the lines with pencil first, and then trace over in black pen. Accent the four ends with three pearls. Cut three 1" squares from patterned paper, and round two opposite corners on each block. Adhere to the front of the card where the black lines intersect. Stamp the strawberry directly to the last slot, and then stamp to red and brown cardstock. Cut out, glitter the brown piece, and layer together on the card. Stamp the sentiment below the squares, "hugging" the black line. And I did this next little cutie just to use those fabulous pink heart sequins!! I ♥ them....and they make a perfect little love tree!! Love it! And here is another case of using a licensed character cartridge to get the perfect cut. The tree trunk comes from the Pooh & friends cartridge, and it is the only cartridge that I own that had this perfect shape. Love finding little treasures where you think you wouldn't! Instructions: Fold white cardstock in half to make card base, and round the bottom corners. Cut a two inch circle from white cardstock, and heavily coat with spray adhesive. Start layering the heart sequins to the circle. Once it is covered, sit something fairly heavy on it and let dry for a few minutes. Cut the tree trunk at 2 3/4" from kraft cardstocking using a Cricut Expression and the Pooh & Friends cartridge. 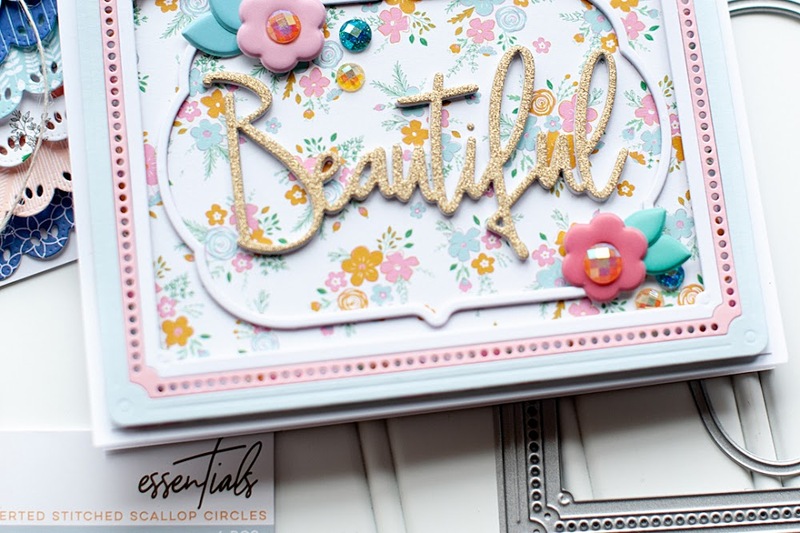 Adhere both items to the front of the card, and accent with chipboard hearts. Stamp the sentiment directly below the tree using cranberry pigment ink. Add the three pearl accents directly below that, and then draw the black square with a ruler and black pen. So, how has your week been? A little off schedule here because of Josh's overnights, but they aren't forever. And once he is done, his store will have brand new carpet! So, it will be worth it. I have been researching more wedding album options for my collections, hoping to make them more affordable. I think I have found who I want to use, and the plus is that she is in this state! I love supporting local business owners, and her albums are beautiful and much more affordable than the company I was thinking of using. So, it is a win win for me! Yay!! So, I loaded a couple of older soundtracks to my iTunes catalog the other day from my humongous CD collection, and I had totally forgotten how much I LOVE this song off the Crazy/Beautiful soundtrack. I thought I would share it. Is it such a beautiful melody and voice...love it. Sorry about the random video...the other one I found was a little inappropriate for my blog, so I just used this one. I think it is a bunch of random television show and movie couples....but whatever. I just wanted to share the song with you!! Tee hee! I hope you enjoyed listening to it! All cards are beautiful, but the second one, I love it! 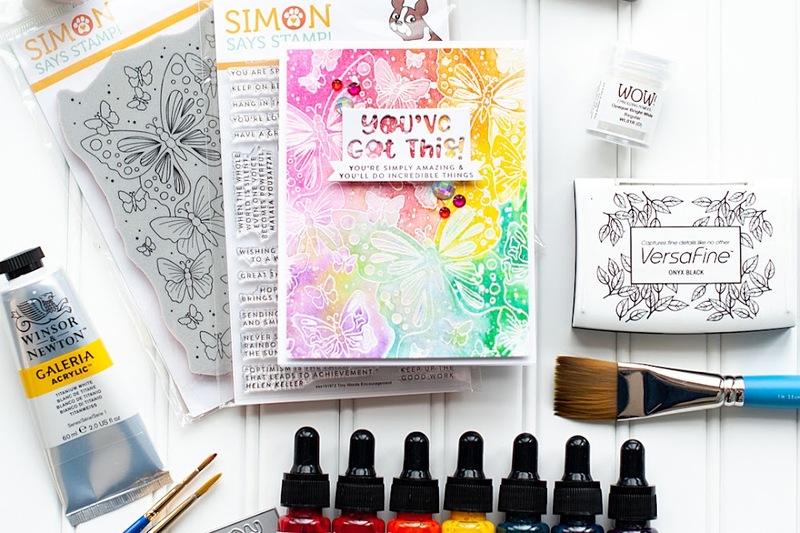 And you can 'work' white cardstock like no other! Your design style is amazing! Have a good weekend! fabulous CAS cards, Lea! love the chocolate (sparkle) dipped berry...genious! I can't even say enough how much I love your CPS card for this week! LOVE how those colors stand out against the white. BUT...a close second love is that Chocolate Hugs card, CUTE! I love white too and I have to make myself use other colors! 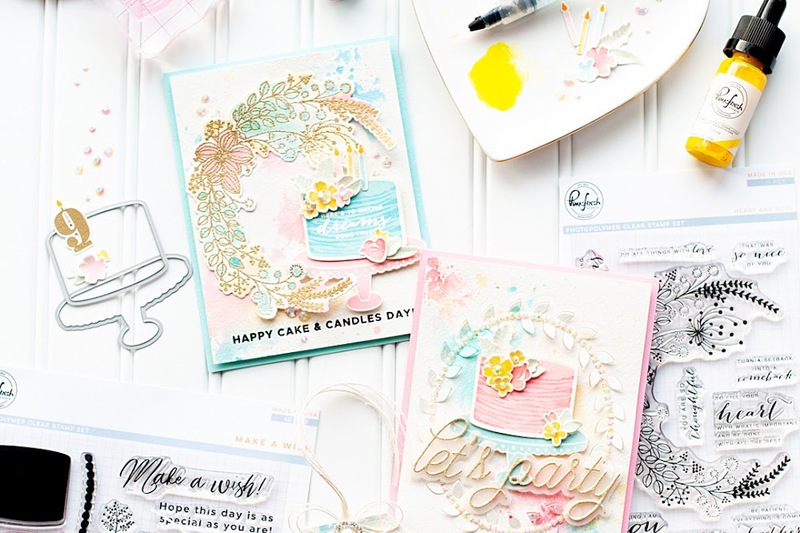 Such darling cards! I love your chocolate dipped strawberry! Lovin' all of your cards!!! I love white, too, and your cards certainly made them more attractive! Have you ever tried GinaK's Pure Luxury? It's perfect for Copics and the thickest in the market. Another fan of white here. Love all the cards, but especially #1. Oh my Lea you just keep pumping out such gorgeous cards! Love them! you never cease to amaze!! wow!!! these are soooo cute, especially the chocolate hugs. tfs!! OMG, these are all fab! I really love your cards, especially the I heart U one. Love the simplicity yet cleverness of it. You are "Da' Bomb", Lea!!! I love all your cards, especially the CPS card.. just so flippin' awesome!!! I love white cardstock too! I don't like those with a greyish tint though! Hi, Lea - I've seen you in CARDs...not sure why I've never happened by your blog. I love your cards....so colorful...so fun...so different - an no 2 look alike; what a great sense of style you have. The little chocolate on the strawberry is such a great addition! Lovely cards, Lea. Love the second one. I am a vintage kind of girl so Vintage Creame from PTI is my favorite. I do love your clean and simple style. Wow! I love your style! What wonderful cards! Hi Lea! I LOVE all three cards! They are all just simply beautiful!! Love your cards..especially the first one...so clean and so simple...it just took my breath away..
You make awesome cards! I've been missing in the blogging world for months but never stopped dropping by here just to look at your beautiful creations. Now, I'm inspired again. Thanks to people like you! I love coming here for a visit! You always have the most colorful, cheerful cards!!! AWESOME as always! Hey Lea I have something on my blog for you. 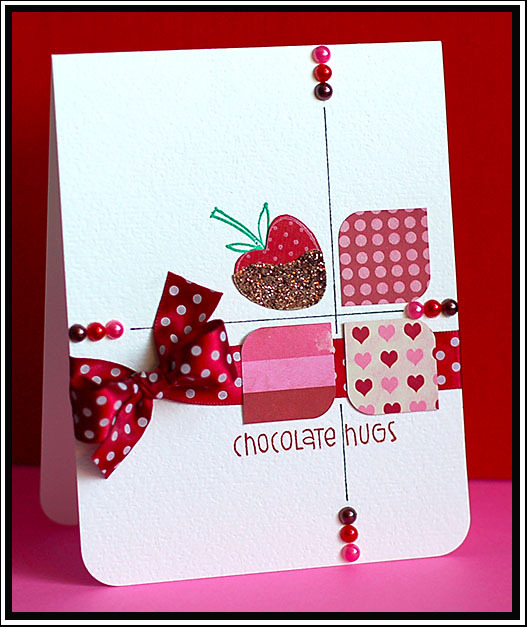 Love these cards, especially the chocolate hugs! What a cool design. Especially LOVE the chocolate hugs! These are all awesome, Lea! Love your style!! I allways love your "rainbow coloured cards". This one is so stinking cute. TFS. Wow such pretty cards.I love that I don't even have to see which blog I'm reading in my reader to know that they are your cards! Oh wow, such cute cards! I LOVE the strawberry dipped in glitter - fabulous! The heart rainbow with matching rhinestones is awesome as well, and gotta love that tree made out of those heart sequins! You've done a great job on all of those cards! OK Lea I am totally in love with these white cardstock cards! I must attempt to recreate something like that. fabulous!!! Oh man, I cannot even tell you how much I love these! especially that first one...clean and simple rainbows *swoon*!!! Hi Lea, just love these cards. Loved the first one so much I 'cased' it!! Blogged about your blog on my papercrafts blog. Hope you don't mind! Love all of these cards! WOW! You blow me away! Majorly in love with your i heart u card! Beautiful cards! I love the second one so much I'm going to try to do a St. Patty's version of it. Thank you for sharing your amazing work!